Do not secure any objects (e.g. coat hangers) on the NECK-PRO head restraints. Otherwise, the NECK-PRO head restraints may not function properly, or in the event of a rear-end collision may not be able offer the level of protection they are designed to provide. 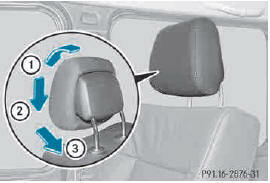 Head restraint covers prevent the NECK-PRO head restraints from triggering correctly. Consequently, the NECK-PRO head restraints cannot provide the intended level of protection. Do not use head restraint covers. The NECK-PRO head restraints increase protection to the driver's and the front passenger's head and neck. The NECK-PRO head restraints on the driver's and frontpassenger seats are moved forwards and upwards in the event of a rear-end collision of a certain severity. This provides better head support. If the NECK-PRO head restraints have been triggered in an accident, reset the NECK-PRO head restraints on the driver’s and frontpassenger seat . Otherwise, the additional protection will not be available in the event of another rear-end collision. You can recognize if NECK-PRO head restraints have been triggered by the fact that they have moved forwards and can no longer be adjusted. For safety reasons, have the NECK-PRO head restraints checked at a qualified specialist workshop after a rear-end collision. When pushing back the NECK-PRO head restraint cushion, make sure your fingers do not become caught between the head restraint cushion and the cover. Failure to observe this could result in injuries. ► Tilt the top of the NECK-PRO head restraint cushion forwards in the direction of arrow 1. ► Push the NECK-PRO head restraint cushion down in the direction of arrow 2 as far as it will go. ► Firmly push the NECK-PRO head restraint cushion back in the direction of arrow 3 until the cushion engages. ► Repeat this procedure for the second NECK-PRO head restraint. Resetting the NECK-PRO head restraints requires a lot of strength. If you have difficulty resetting the NECK-PRO head restraints, have this work carried out at a qualified specialist workshop.